The following article was submitted by Ra1don (before he was brought on as a staff member). The opinions expressed below do not represent those of Ani-Gamers or its affiliates. Ahh, I could still remember that day in 2005, going over to a friend's house to play his special edition copy of Age of Empires III and flipping through an included book. I don't quite remember what was in that book, but I remember on one of the last few pages, there was a picture of two groups of futuristic super soldiers fighting each other in all their splendor. "Wow," I thought, "I have to get this game." Before I start my review, let's get a little history lesson going on. That picture of the futuristic soldiers duking it out was indeed a very early version of Halo Wars. This game was never really intended to be latched onto the Halo franchise, but rather an Age of Empires IV built exclusively for the console. After attempting to build the game's controls around the game itself for a few years, Ensemble scrapped their work and started over, creating the controls first and building the game around that. 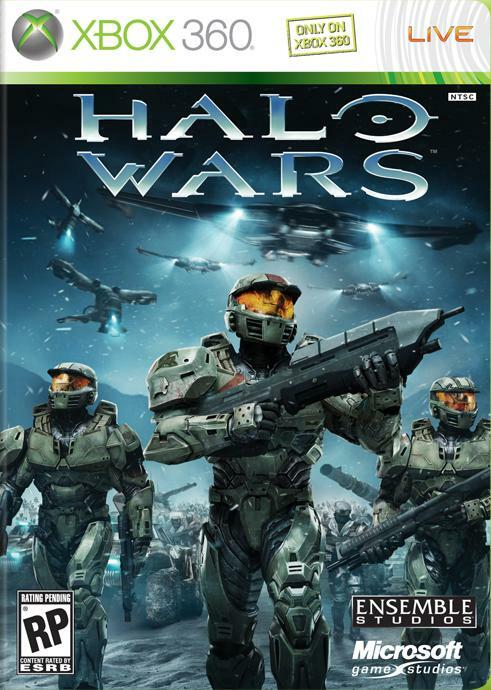 It wasn't until 2006 that Microsoft allowed them to use the Halo franchise in an attempt to boost the game's popularity and expose the public to this new vein of RTS games. The single player campaign of Halo Wars is very much like any other RTS campaign; it slowly brings you through the learning curve by showing you how to control units and build bases until you have to fight off wave after wave of unrelenting enemy forces towards the end of your campaign. The story is a prequel to the events of Halo: Combat Evolved and takes place six years after the fall of the planet Harvest. Many familiar themes come into play; the Prophets stop at nothing to continue the great journey, you go toe-to-toe with Grunts, Elites, Hunters, Jackals, Brutes, and many familiar vehicles, as well as some new ones, and you have to blow up some forerunner technology to save everyone's lives. The gameplay within the storyline is slightly different from multiplayer or skirmish matches. For one thing, there are some campaign-exclusive units that effectively change battle scenarios throughout the campaign. They usually give you an unfair edge over the enemy and make some missions a cakewalk if you're playing on the "normal" difficulty level. On top of that, in some missions you're given ridiculous amounts of something, like 11 Spartans as opposed to the maximum 3 in multiplayer, 40 Mass Accelerated Cannon rounds, or free drops of fully-upgraded ODSTs. The hero system within the campaign is different as well, marking Spartans as hero units, as well as your leader. When any of your heroes die, you can revive them as in Age of Empires III by bringing a friendly unit close to them. In the other game modes, heroes just die and they have to be resurrected, and as a balancing issue, UNSC leaders do not actually enter the battle yet act more like the governors in the AOEIII system. The game's graphics are the best I have ever seen in an RTS. It includes incredibly detailed, slightly different renditions of the characters of Halo to take time difference into account. The sounds within the game are ripped directly from the Halo series, and their quality has been improved to allow for sound cues within battles. Playing online is incredibly entertaining because each of the six leaders has a different way of playing the game, therefore making an effective six races. Because the game is not as strict as other RTS games such as StarCraft, no two players can play the game the same way. The limitation of how many buildings one can create force a player to specialize in one aspect and utilize it to its full effectiveness. Ensemble claims that there is a rock-paper-scissors type balancing within the game, but I found that to not be completely true. The game's unique style of play puts strategy over production, and in a battle of ODSTs versus Grizzly tanks (Scorpion tanks with two cannons) a good commander on the ODST side has about as much of a chance of winning as the commander of the Grizzlies. The largest drawback to playing online isn't caused as much by the game as by player mentality. When I first got Halo Wars, I ran through the tutorial levels, fought some skirmish battles, played online, then played through campaign mode. The average player, however, would play the campaign before they would play online. Because the campaign only covers the UNSC, about two in every three members of the online community play as the UNSC. Regardless, battles still turn out interesting with every player having their own unique strategy, making every battle different. Overall, Halo Wars is a great game, earning most of that greatness through its uniqueness. Being a veteran of many RTS games, I can comfortably call this one of the simplest  but simultaneously one of the most fun  games I've played. I wouldn't recommend buying it if you don't have access to LIVE, but the skulls and achievements allow for a lot of replay value, as does the ability to create your own scenarios through the skirmish option. Even with LIVE, the $60 price tag seems a little steep, but due to its addictiveness, Halo Wars is definitely too valuable to rent. Chances are, the price won't drop because it is part of the Halo franchise, so do a few odd jobs and the game will pay for itself.